K L University scheduled to conduct Paper Based Test and Computer Based K L University Engineering Entrance Examination (KLUEEE) on 30th April 2016 and 13 & 14 May 2016. Candidates who had applied can download the admit cards/ hall tickets now for both online and offline examination from the official website of K L University or a direct link is provided below. About K L University: K L University is known as officially the Koneru Lakshmaiah Education Foundation. It is a deemed university located in the Vaddeswaram Guntur District of Andhra Pradesh, India. K L University consists of 11 academic departments and six schools, with emphasis on scientific and technological research. It conducts various entrance examinations for the admissions into Under Graduates, Post Graduates, Research(Ph.D.) Programs, M.Tech(By Research) leading to Ph.D.,M.Phil. Download admit card of K L University Entrance Test 2016: This year it has released notification for the KLUEEE 2016 and the candidates who had applied can get the admit card from the official website of university or a direct link is provided below. Candidate are advised to read the instructions carefully which is mentioned on admit card. It contains the details of date, time and venue of examination. Visit the official website of K L University or a direct link is given below. 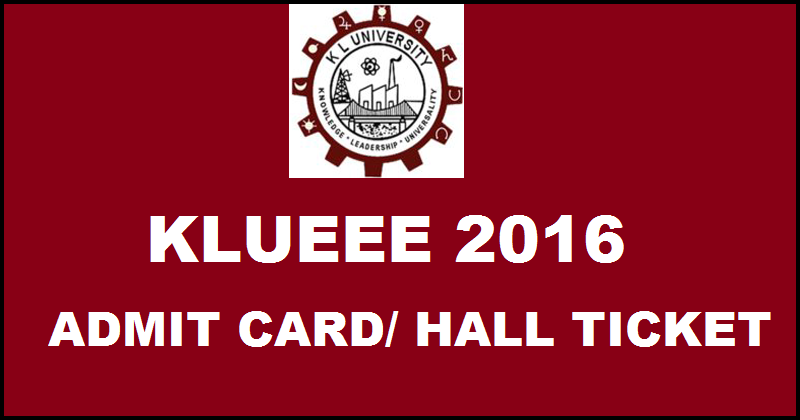 Click on “Admit card of KLUEEE 2016”. Enter the required fields and press the submit button. For more information, please visit the official website of K L University regarding examination.